How do you fight local corruption in China? China’s anticorruption crusade after taking down many high officials accused of graft—“tigers” in the political parlance—has been showing signs in recent weeks that it might be time to go after lower-ranking cadres--or “flies”--whose behavior has been equally dishonorable. And in one province a bit more than a month back, some at least are being given tools to do the job. 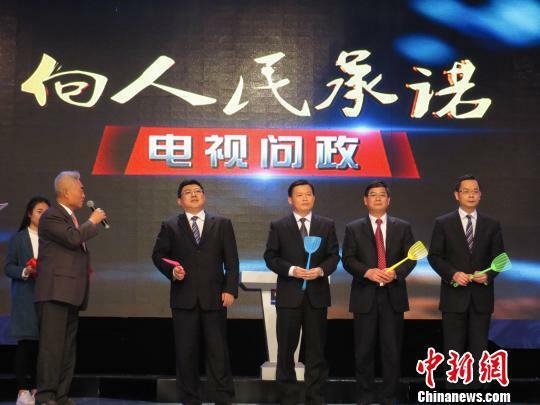 On a popular evening politics program in Nanning, the capital of China’s southwest province of Guangxi, Communist party leaders in four counties were called on stage to account for recent reports showing that government officials were using their working time to research stocks, purchase lottery tickets, play games, watch videos, read novels, as well as “other violations of work discipline”. The party secretaries in each county appeared on stage with fly-swatters, given as a gift to help them deal with the “flies” whose very laziness was corrupting. Each pledged to smack their staff into shape. On one level, this is an all-too-common story in China. Neither the province of Guangxi nor its capital is a stranger to allegations of government shortcomings and graft. Guangxi has been the target of anti-corruption inspection teams since President Xi Jinping’s national campaign began, with Nanning itself having seen its share of “tigers” toppled from office in the past year—including the city’s leader, the party secretary, currently under arrest on corruption charges. And just a few days before the show aired, Guangxi officials accused a set of education administrators of charging students fraudulent fees; taking kickbacks from contractors and publishers; and then using the funds they illicitly procured for unauthorized trips and other personal expenses. Clearly, the “flies” are abundant in Guangxi. The question for Beijing has been how to eradicate them. There have been experiments in dealing with the locally corrupt or incompetent. In 2012, the city of Wuhan premiered a television program seeking to introduce more accountability into government operations by inviting decision-makers on stage to explain and defend their policies—or that there were so many social problems that were going unaddressed. 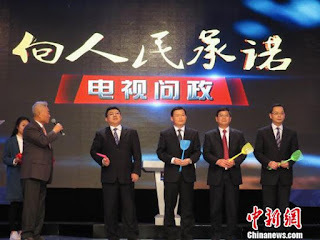 The on-air effort to make cadres answerable had proved popular for a time among many viewers and spawned similar formats in a couple of Chinese provinces. But the program has only appeared irregularly; the concept has never been approved as a template for national television in China. Probably Beijing wasn’t comfortable with emboldening citizens to play a direct part in evaluating officials: Cadres themselves may well have complained to their superiors, or the shows might have smacked of democratic participation in ways that made some leaders leery of where it all might lead. So what’s new in the Guangxi case is the lengths someone in authority went to, both in exposing the bad behavior, and by enlisting a format that seemed to have been in hibernation. Apparently, the political leadership (there or above) became so frustrated with the level of corruption in Nanning that they decided to stop pretending that local cadres would cease their looting on their own, and try something a bit different. That there was a difference in Nanning became clear because the television program kicked-off a debate: Between those who argue for the positive role television might play in local politics in helping Chinese politicians communicate with the public, versus those who think such programming is simply incendiary and therefore unhelpful. Not surprisingly, the middle ground seemed the safest. According to one commentator, choosing to hold officials publicly accountable by employing the format pioneered in Wuhan still makes sense, but it needs to be managed very carefully. There are political dangers for Guangxi (and for other provinces) if the program was revived and shown regularly to try to kill off “flies”. The most obvious risk is the reaction of local officials. Everyone agrees that it’s crucial to at least contain the corrupt practices of cadres—whether it’s robbing public coffers or shirking responsibilities-- if only because China’s economic and social challenges deserve careful and sustained attention by local governments; allowing officials to ignore work and concentrate on rent-seeking leaves problems to fester. While Beijing seems more interested in making examples of officials behaving badly by flying in inspection teams and grabbing the greedy and guilty for trial, local authorities haven’t been given much autonomy to deal with graft from the ground up. Exposing local officials in such a public way might actually work small wonders. But to attempt to fight corruption by publicly gifting fly-swatters to county party secretaries because their staff hasn't been well-supervised had to be humiliating for the recipients. Singling these officials out for public ridicule will please angry citizens. At the same time, such events create enemies within the party ranks. Feeling under siege by both Xi and Guangxi, it’s not guaranteed that cadres will simply slink away and mend their ways. Indeed, officials could mobilize and strike back, by retaliating against who organized the spectacle, or to resist those looking to change what for many officials has after all been common practice for years. Already one essay warns that such programs aren’t helpful anyway, because they only produce resentment and disappointment, and that actual reform has to come from within. There’s another problem where public expectations are concerned. Residents in Guangxi who want programming that seeks to hold officials accountable to become a regular feature of local television aren’t likely to get support from Beijing, especially as the Xi leadership clearly prefers to run the anticorruption crusade from the top-down. It’s understandable if citizens in Guangxi shrug their shoulders and remain apathetic, because that’s usually what happens in China. But the local level of disgust with official behavior isn’t going away, and new activism might overcome old apathy. A couple of hours or so of television programming isn’t going to satisfy some citizens—the ones who love a good show but wonder whether they’ll ever be allowed to get out of their seats to help slap the pests that are annoying them. Whatever the outcome in Guangxi itself, it’s good that at least some people there are thinking that it’s worth the risk to take action before local governance deteriorates in practice and perception even further. Now the challenge for Beijing is to decide whether such experiments are worth expanding, or if Xi and his allies see these efforts as just so much swatting at flies. Nanjing And Beijing At Odds? Will The Real Xi Please Stand Up?